Toyota’s longest playing nameplate is also its most expensive model. 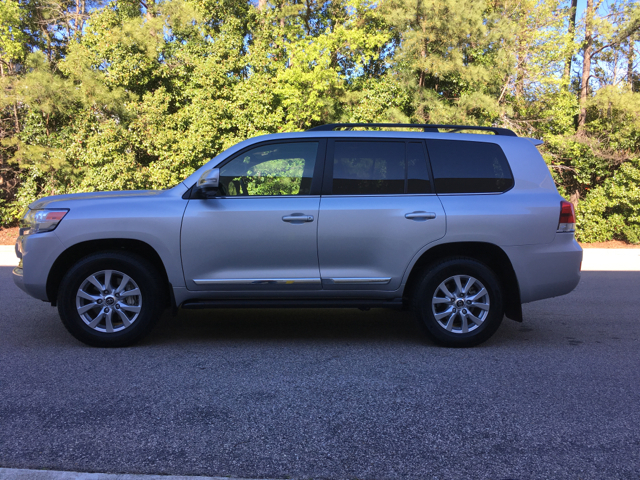 The 2017 Toyota Land Cruiser is available in one trim: CE. The very first Toyota Land Cruiser was introduced in 1951, a Jeep-like vehicle built under contract to the US military for use in Korea. Based on the original Willys theme, the first “Toyota Jeep BJ” was larger and more powerful than its American counterpart. Years later, the Land Cruiser is still being made, although what is offered today is nothing like the original. The current model, introduced in 2008 and refreshed since, induces a more safari-like look, although its ride, interior trappings, and build quality underscores why Toyota charges more than $85,000 to customers. 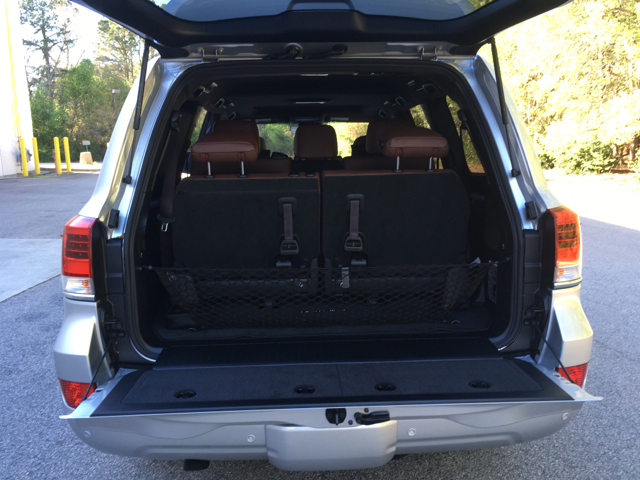 The 2017 Land Cruiser is available in one well-equipped trim, CE, and offers no packages. There exist a few accessories you can add, including an accent stripe ($149), special Blizzard Pearl paint ($395), and remote engine start ($499), to name a few. Thus, your final price might top $87,000, including a $1,195 destination charge. You simply won’t discover a more expensive Toyota than the Land Cruiser. Which brings me to another point: since the current model rolled out, a Lexus LX version has hit the market. Add about $5,000 for the Lexus and you have an equivalent model. I drove the LX last summer; my review can be found here. If you desire to purchase a new Land Cruiser, be prepared to work with your dealer to order one. Not all dealers carry this vehicle, especially in places where winter driving isn’t an issue. Toyota sells about 250 Land Cruisers each month or about the number of Camrys it sells every four hours. LX sales are nearly double that of the Toyota, which may mean customers feel it is worth the extra investment to obtain the luxury cachet. The Land Cruiser is a traditional body-on-frame SUV and that means it is based on a truck body, not a car platform. 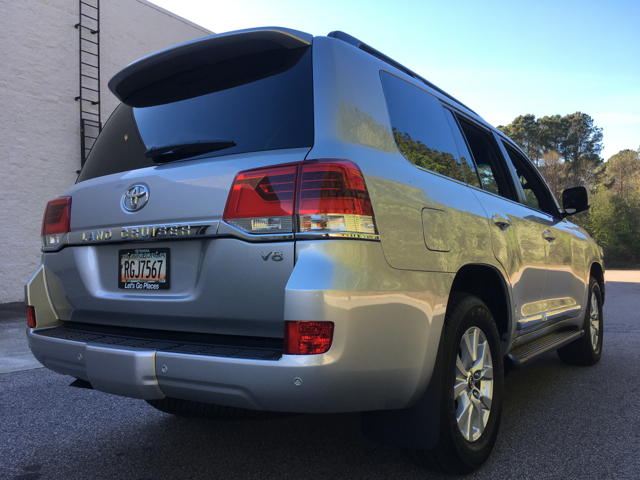 Although pricier than the Sequoia by as much as $40,000, the Land Cruiser is nearly a foot shorter overall. Both models are based on an earlier Tundra platform, but for the Land Cruiser it was shortened and strengthened accordingly. 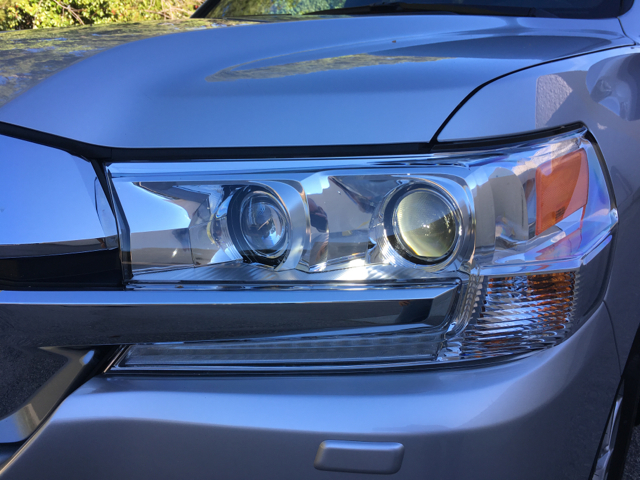 Toyota pulls out all the stops when equipping the 2017 Land Cruiser, including fitting every model with 18-inch split-spoke alloy wheels, projector beam headlights with automatic on/off and auto leveling as well as headlight cleaners, LED daytime running lights, fog lights, accent lights and rear lights, and heated and power-operated side mirrors. You’ll also find aluminum running boards, front and rear tow hooks, front and rear mudguards, skid plates, and a color-keyed rear spoiler. A power tilt and slide moonroof with a sunshade is standard. Inside, the Land Cruiser offers room for eight in a 2-3-3 layout. Behind the front bucket seats is a 40/20/40 split-folding bench seat with a 50-50 split-folding bench seat following in the third row. Every seating position behind the front row comes with folding headrests. 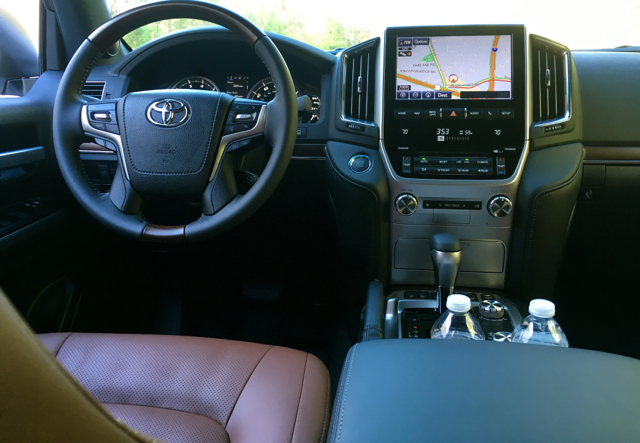 The cabin is big although not as cavernous as you would find in the Chevrolet Suburban or Ford Expedition. Instead, it is nearer in size to the GMC Yukon and Chevrolet Tahoe. 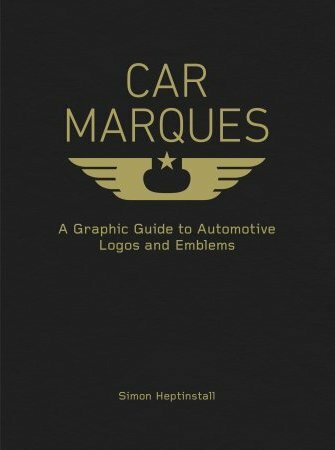 You’ll find plenty of high-end materials throughout the cabin, starting with the semi-aniline leather seats, the leather-wrapped steering wheel, and the leather-trimmed shift lever with a wood-grain style inlay. The door inlays are also dressed in leather. 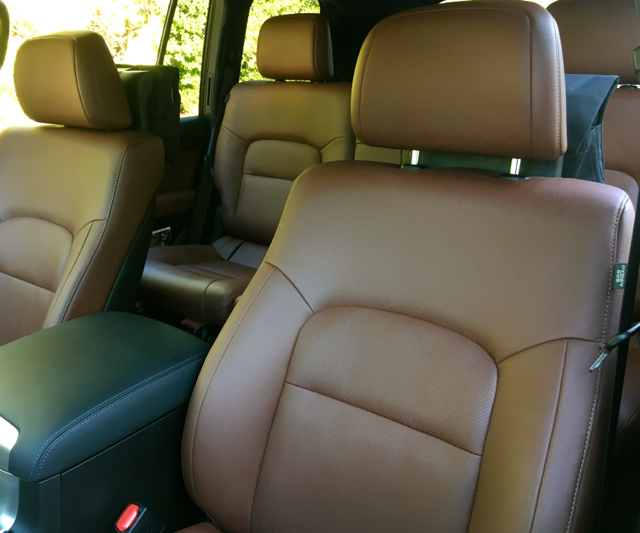 The front seats are power operated and provide lumbar support as well as heating and ventilation control. As the driver’s you sit at a command position at all times — the seat moves back and forth, but its downward placement is minimal. Personally, I would prefer to have the option to sit somewhat lower. Other than that, the driver’s seat is comfortable. 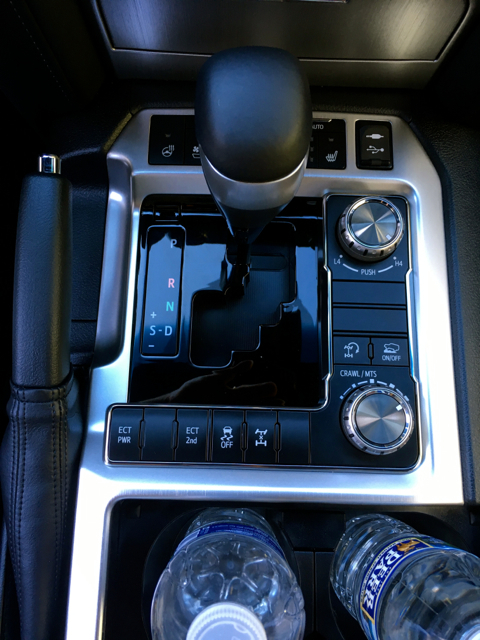 A power tilt and telescopic steering column with a heating function; full power accessories; keyless entry with push-button start; multiple consoles, storage bins, and door pockets; and 12 drink and cup holders are included. Every model has a 14-speaker JBL audio system with a subwoofer along with a nine-inch color display panel, HD Radio, satellite radio, related apps, a backup camera, Siri Eyes Free, and Bluetooth. 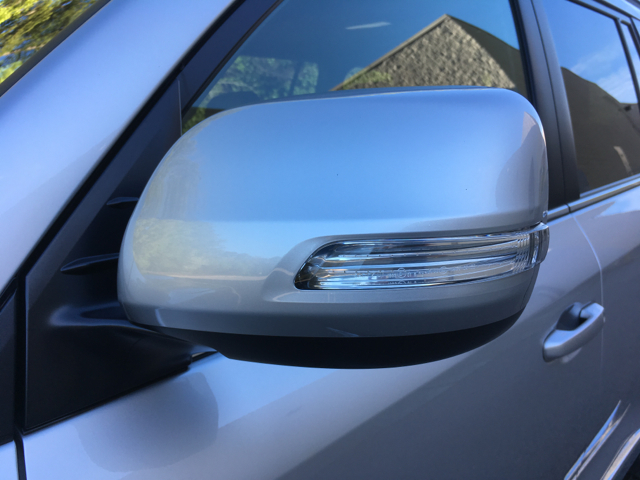 Standard safety features are many and reflect in part this model’s high value. But it also underscores Toyota’s safety commitment up and down the product line. And that’s why by the end of this year, nearly all Toyota models will come equipped with Toyota Safety Sense-P (TSS-P), a suite of safety features. TSS-P includes a pre-collision system with pedestrian detection, lane departure alert, automatic high beams, and dynamic radar cruise control. The latter system automatically maintains space between the Land Cruiser and the vehicle immediately in front, adjusting the SUV’s speed downward as needed. You’ll also find 10 standard airbags, including driver and front passenger knee airbags. Trailer-sway control, hill start assist control, and front and rear parking assist sonar are included. Incidentally, what you won’t find from either of the major crash testing entities — the Insurance Institute for Highway Safety or the National Highway Traffic Safety Administration — are crash test results. The Land Cruiser is too costly to test and because of its size, it provides an ideal and the safest environment for passengers. I’ll have to disappoint a few of my readers immediately by admitting not once did I take the Land Cruiser off road. Time was the most important reason why — to take the Toyota to a place where I could march across an open field or climb a craggy hill meant traveling a great distance to where I could accomplish these feats. Absent that, I relied exclusively on my on-road driving and experience driving other Toyota 4×4 products such as the Tacoma and Tundra to state the obvious: the Land Cruiser is a true 4×4 beast. 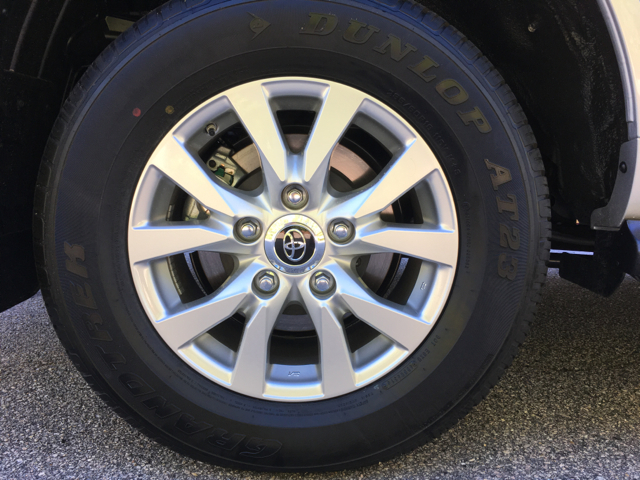 If you do have the opportunity to take this Toyota off-road you’ll find that it comes outfitted with a solid rear axle for flexibility and durability. This model has a permanent four-wheel drive system with a locking center differential. 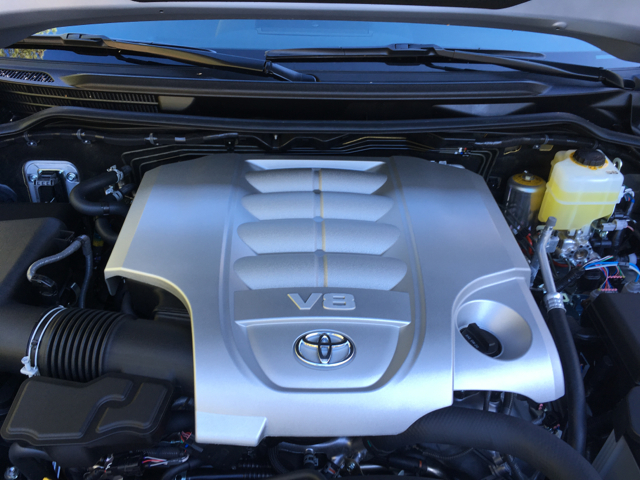 Under the hood is a 5.7-liter V8 engine with 381 horsepower and 401 pound-feet of torque paired with an 8-speed automatic transmission. Weighing just under three tons at 5,815 pounds, the powertrain is entirely suited for the Land Cruiser. As such, you can expect fuel economy of 13 mpg in the city and 18 mpg on the highway according to the EPA. Toyota claims the Land Cruiser has a fording depth of 27.55 inches. That’s about 8 inches taller than your typical Subaru or Jeep Wrangler — yes, Jeep no longer claims a 30-inch depth rating for the Wrangler as this Jalopnik story claims. Of course, crossing any body of water means using your brain and taking it real slow. Got that? Around town, the Land Cruiser is quite a spectacle. Its formidable comportment projects an assertive stance, but its polished visage means it looks entirely in place on Fifth Avenue or Rodeo Drive. Or at the foot of your circular drive. As for investing in the Land Cruiser, this means turning away from its almost twin, the Lexus LX and the prestige that comes with the Lexus marque. 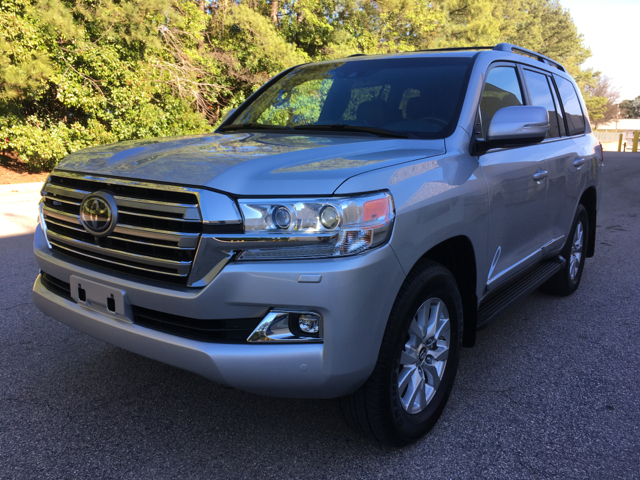 Other models such as the Land Rover Range Rover, Cadillac Escalade, and Mercedes GL-Class bring their own attributes, but when it comes to a time-tested name, the Toyota Land Cruiser is at the top of the pack.